Frank Lampard is likely to line up against old rival Steven Gerrard for the first time in Major League Soccer on Sunday, but the former Chelsea midfielder says it could have been him in the LA Galaxy shirt. Instead, he joined New York City FC in July 2014 while ex-Liverpool captain Gerrard opted for Galaxy this summer. Lampard, 37, told BBC's Football Focus the timing was wrong on a move to LA. The pair will be "enemies" in Gerrard's eyes when they meet again. "I had a couple of opportunities a couple of years ago," Lampard said. "They didn't happen in the end. "It wasn't the right time for me then and New York was coming round and it's certainly the right time for me now." LA Galaxy president Chris Klein confirmed the club nearly signed Lampard as their designated player two years ago. "It was a couple years ago, and we came close," he said. "He's a very good player and a good guy and someone we talked to for a long time. Timing just didn't work out, I think, on both sides. "But we're happy he's here, happy he's in the league and playing for New York." Both permanent fixtures for many years at club and country, the Lampard-Gerrard conundrum sparked many a debate and no shortage of rivalry on the field. "It's different now," said Lampard, whose Premier League career was bookended by West Ham and Manchester City while Gerrard, 35, spent his entire time in England at Anfield. "We had many rivalries over the years with Liverpool and Chelsea and it was intense. It will be no different the fact we want to win badly. "When we step on the pitch we are both winners, both want to win and we're both bad losers, so that won't change." Gerrard, who says the attention on him and Lampard in the build-up is "slightly embarrassing", added: "If he plays from the beginning or he comes on, we become enemies. When the game's over we become friends again. "It mellows when we're not competing against each other, of course, but we're both winners, we're both professional. "When that whistle goes and for 90 minutes we're competing against each other, it's war. We fight against each other, we always have. "When the whistle goes to finish there's a mutual respect there and we've always got on off the pitch, regardless of what people say. "He's coming into town for three points and I want the three points to stay here, so that's where the rivalry begins." 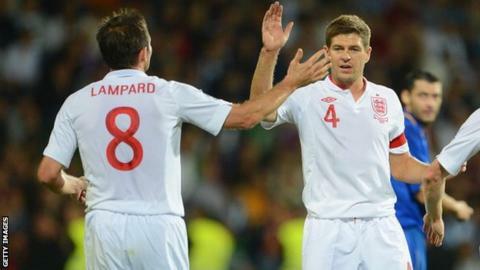 While Gerrard became the second England captain to join LA Galaxy after David Beckham in 2007, Lampard faced the challenge of signing for a side playing their inaugural MLS campaign in 2015. "It was a challenge that I took on knowing what it was," said Lampard, who spent last season on loan at Manchester City. "When I signed we hardly had one player - I was one of the first - but the way the club and whole project was sold to me, the move was the right thing. "The owners said to me: 'We need you not just for what you can do on the pitch, but to try to help us grow as a club'. Myself, David Villa and [Andrea] Pirlo all have responsibilities to try and help everyone. "It's a huge deal. They have a real opportunity to bring a football club that can be successful and that they're proud of." He is joined by World Cup winners in the dressing room in Italy's Pirlo and Spain's Villa, but Lampard says there is little room for egos at the Yankee Stadium. "We have David Villa and Andrea Pirlo who are world stars, with great careers and great experience," he said. "(It's) a pleasure to be sitting alongside and training and playing with them. "Then we have a lot of American lads who have played in the MLS for years, who are very keen to do well and train really hard - great players and team-mates to have next to you. "There are no egos in our dressing room, at all. Whether it be the big world stars or the players who have been in MLS many years, we just want to be successful so it's been very enjoyable." Gerrard is an admirer of New York's Pirlo, but also of Galaxy team-mate Robbie Keane, whom he played with at Liverpool. "He (Pirlo) is a magician with the ball at his feet, so don't give him time, don't give him space and try and be aggressive when he receives the ball," Gerrard said. "When you talk about a playmaker from deep, I don't think there have been many better - the guy is a joy to watch and nightmare to play against." He added: "We've certainly given him (Keane) the service and he's thriving on it. He's in form at the moment, and so is David Villa, so it's going to be a good shootout." Lampard is confident the profile of the sport, and the MLS, is rising in the USA. He faces a Galaxy side on Sunday that, as well as Gerrard, includes former Tottenham Hotspur forwards Keane and Giovani dos Santos, while Brazil's Kaka, of Orlando City, featured in the MLS All-Star team this summer. "LA Galaxy are the most successful team in the history of MLS. A very strong squad, we all know that," Lampard added. "The game here has really taken off. I have seen that more first-hand being around the city and walking through the streets. "I used to do it at Chelsea years ago - go unseen basically - and now you do it and people are asking you, whether they are NYC FC fans, Chelsea fans or Premier League fans, so it shows you where the game is going. "I hope it carries on the same curve with more players coming out here and I think the respect of the league is going up all the time. "I think the level of the league generally is improving." "It's a lot better than what I thought. It surprised me," he said. "I think the level is a lot stronger than other people's opinions suggested before I came here. "We've got a very good team here. I'm playing for the champions, they know how to win. I'm very happy with my team-mates and the level of my team." So, which of his old sides is Lampard backing for Premier League glory this term? "Chelsea and Manchester City are going to be the teams that fight it out," he said. "No disrespect to probably Manchester United and Arsenal, I think they will be there and thereabouts as well, but I think Chelsea and Man City have the best squads. "Man City were the best team on the day [when they beat Chelsea 3-0 last weekend], no-one can dispute that. "But it's a long season to go and Chelsea will certainly be in the race because of the quality they have in their squad, because of the manager who is very driven to win, and I see them two fighting it out all the way. "I'll look forward actually to going back to Chelsea. I never really had that opportunity when I left there to go to the stadium to see friends and people behind the scenes. "I'll also keep an eye on Manchester City because they were good to me."